I am honored to feature Ms. Rodgerika's "Hair Story". You may know her by "Iamsonotmyhair" on YouTube, or through her t-Shirt business, "Loving Me Tee's." Rodgerika was so kind to let me interview her to discuss her lovely Hair Journey. I hope you become inspired! @ Iamsonotmyhair, or CLICK HERE! Iamsonotmyhair: I have been fully natural since September 11, 2010. Natural Expression: What made you decide to go natural? Iamsonotmyhair: I am very versatile when it comes to my hair, but my styling options ran out. I found myself in a hair rut. I would relax one week, put in a phony pony the next week, wig it the third and fourth week and repeat. Aside from that, I always wanted long hair, and for some reason my hair never grew past a certain length anyway. I grew bored of my routine and desperately wanted to try something different. Most of my styles, aside from my relaxer wraps, consisted of curly doo's. I always leaned towards adding volume and LOVED big hair. The only alternative I'd never ventured into yet was natural hair. My family was very supportive of my decision and with the help of the World Wide Web; I was able to find answers to any and every question about going natural. I was due to relax after vacation in May but skipped my appointment and never looked back. Natural Expression: When and how did you transition into natural hair? 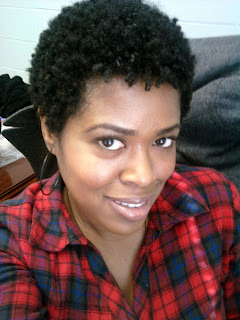 Iamsonotmyhair: I transitioned from May-September 2010 using wigs and phony ponies. Everything was going fine until I got to my second month and realized I was not going to be patient enough to transition for a year, as I had originally planned. I developed a case of hand in hair disease early on (lol) and after the third month, I couldn't take the suspense anymore. I woke up one morning and decided today is the day. I did my own BC on September 11th. Afterward, I felt a sigh of relief, having no more anticipation, and was happy with the results immediately. Iamsonotmyhair: I like the fact that it opens up a whole new area of versatility in styling and it also means one less chemical that I have to use on my body. I like the idea that I may also be able to grow my hair as long as I always wanted but until now was never able to achieve. Iamsonotmyhair: I would say it’s changed my way of thinking. I am more cautious about the products I use on a daily basis. Whether it is for face, skin or any other area, I now look at labels and look up ingredients before purchasing or using products. I also eat healthier and eat less processed foods. I do a lot of meals at home. So you could say it’s changed my pockets for the better also. Natural Expression: How has natural hair affected you if it has in anyway? Iamsonotmyhair: It has affected me because I always adored my late father's hair. It was usually cut in a low Cesar but was curly and jet black and he never dyed it. When I BC'd I looked in the mirror and saw my father’s hair! I couldn't (and still can't) stop starring at it and touching it. I hear a lot of new naturals say I wish I would have cut it sooner, but I guess I'm opposite. I'm glad that I waited because now I can really appreciate what God gave me and have the tools and knowledge to take care of it properly. My going natural has also affected those around me. My supervisor decided she was done with relaxers after seeing my 2 inch fro. She said she always wanted to go natural, and BC'd 7 weeks later. I catch my mom and sister smiling at my hair and my hubby loves to play in it. I haven't gotten any negative feed-back thankfully. For the most part I get compliments and sometimes questions from others looking to BC themselves. Iamsonotmyhair: I would tell them make sure you do your research and don’t expect your hair to look like anybody else’s. Just be ready to accept what God gave you and embrace it. Your hair is beautiful and when you accept that everything else will fall into place. They should go natural because it is a healthier way of life, its God given, it’s each individual’s unique trait, and you learn more about YOU. Natural Expression: What is a brief description of your regimen (please include the products you use)? Iamsonotmyhair: I shampoo weekly with Organic Excellence Mint Shampoo and deep condition weekly with Organic Root Stimulator Replenishing Conditioner. With each wash, I alternate conditioners between Herbal Essence Totally Twisted, Tresumme Flawless Curls, and VO5 Moisture Milks. I add a bit of EVOO to my conditioners. After each wash, I use Herbal Essence None of your Frizzness leave in and seal with my oil mixture which consists of EVOO, coconut, avocado, and Castor oil. For styling I use Carefree Curl Gold for fluffy twist outs. For wash n go's or finger coils I use LA activator gel, IC Fantasia styling gel(Clear) or Organic Root Stimulator Smooth n' Hold Pudding. To refresh between styles I rotate Palmer's Coconut Oil hair milk lotion, my oil mix, or water. Natural Expression: What is your favorite Hairstyle? Iamsonotmyhair: My favorite hairstyle is the washngo. My others are fro hawks and fluffy twist outs. Natural Expression: Is there a blog/web page where we can find you? Iamsonotmyhair: My hair texture is coarse and tightly coiled. My hair grows in curls like tiny corkscrews. My curls down the middle of my head are a little looser than the sides. But for the most part if I had to categorize it in a box, I'd say it was 4a. I honestly haven't had any bad hair days or problems with my hair, except for overcoming initial dryness through DCing. I detangle using my fingers only, as I condition, and at 7 months post relaxer, it still works for me. Natural Expression: What mistakes have you made with your hair that you've learned from? Iamsonotmyhair: So far I have only made one mistake and that was using a mayonnaise product I used when I was relaxed and not reading the ingredients. It left my hair hard and dry with frizzy ends. I had to redust my ends because of a simple mistake that could have been prevented if I would have just read the label. Natural Expression: What's the best/most effective thing you do for your hair? Iamsonotmyhair: Leave it alone. Less is more with my hair when it comes to products and manipulation. However, my biggest issue is touching and playing with my coils, knowing that's how I cause fairy knots, lol. It's still so new to me. I'm not very fond of protective styles because I always want my hair out, but I understand why they are sometimes necessary, mainly for people like me. As of now, I currently have no hair length goals; I just aim to maintain healthy manageable hair and to keep it in styles that suit me. Natural Expression: Anything else you'll like to add? Iamsonotmyhair: Whenever you decide to go natural, do it for you and own your look. It is a personal journey, so don't expect that you will have hair like the next natural. It's all about the unique aspect we all posses. Also don't get consumed by the define your curl madness. If your hair naturally grows curly, guess what, it's already Godly defined. Just focus on techniques and products that will maintain the health of your hair type and everything else will fall into place. THANKS, her journey is by far inspirational. I know that many readers will take something from it...it's all about encouraging us naturals.